My father and I decided to make a trip out to Southern Ohio for an archery hunt on leased land this past fall. We packed the usual gear -- climbing stands, coolers, bows, and packs -- but this year I was determined to try using a buck decoy. On our second day of hunting, October 31, I decided to use the decoy for our evening sit. The temperature had dropped significantly overnight and another hunter in our group saw a big buck that morning coming out of a thicket parallel to mature oaks that were dropping acorns. The plan was set; the three of us wood stagger our stands along the edge of the thicket so that one of us would hopefully intercept any bucks working the transition, which held numerous scrapes and rubs. With so much gear to pack in for the evening hunt, I decided to head in early at 2 p.m. and drop off my climber and buck decoy. After taking several practice shots at our 3D targets back at camp, we took scent showers and did a gear check for the evening hunt. At 4 p.m. the guys dropped me off at my gear and I proceeded to set up for the hunt. Because I was hunting over such thick cover I decided to set the decoy up very close to my tree, around ten yards and facing me. With the decoy so close and with such thick cover, I knew I would have to climb as high as I could to give myself any chance of a shot. With the decoy facing me, mature buck scent placed on several nearby trees, and me sitting thirty feet up in my climber, the stage was set. After taking a quick picture of the decoy with my cell phone to share with the other hunters, I made a couple of soft grunt calls toward the thicket. Before I could secure the grunt call back in my vest I saw a large racked buck walking out of the thicket at my far left. As the buck approached the top of the hill he immediately saw the decoy. Without hesitation the big buck ran toward the decoy and stopped to the left of the decoy at around fifteen yards. With his head down, the buck began to circle the decoy very stiff legged in a very aggressive state of mind. It was all happening so fast. Would I get a shot at this mature buck? Was he going to engage the decoy, realize it was a set up, and run back into the thicket? As I stood up in the stand and came to full draw, the buck spooked and jumped several feet to my right landing on the other side of a triple tree that stood between the buck and the decoy. This was it, my moment, and I'm at full draw without an ethical shot on a monster buck. As I took a deep breath and tried to calm myself, the buck took two steps forward offering me a perfect twenty-five yard quartering away shot. I placed the arrow on target and let her fly. It felt like a great shot as I saw the buck run away with just the fletching of the arrow showing above his left front shoulder. As I quietly celebrated with myself after the shot, my cell phone rang. It was my buddy hunting just below me on the same ridge. He asked, "Did you just shoot that deer?" Without hesitation and excitement in my voice I said, "Heck yeah." He said, "That buck is huge" and I replied, "I know." As we discussed the shot and the encounter with the decoy we had no idea what was getting ready to happen next. By the time I lowered my gear and climbed down to the ground I could hear what sounded like two bucks fighting or another hunter really hammering his rattle bag. In disbelief, my phone rang again. "Do you hear those bucks fighting?" my buddy asked. Before I could reply "yes", he said, "The buck you just shot is fighting a bigger buck." I couldn't believe what I was just hearing. We had two dominant bucks, one shot with a 100-grain broad head, fighting down the ridge. As I got my gear together on the ground he said, "Ok, it's over, the other buck just ran away." I attempted to slip out of the area so I wouldn't disturb my father who was also hunting the same ridge. I walked about two hundred yards and laid down behind a blown down tree, waiting for dark. Lying there, I couldn't help but wonder about the shot. Was it a good shot if the deer could get up and fight another buck? Had I hit the deer too forward in the neck and not closed the deal? Would the other buck damage my deer's rack during the fight? My phone interrupted all these thoughts when it rang again. It was my buddy and the buck had returned to fight my deer once more. But this time, we were pretty sure the buck that I shot had expired but we weren't certain. The other buck, which we felt was bigger than the one I shot, was attacking and goring the shot deer who was just laying there, not fighting back. At 7:35 p.m. as the three of us approached the top of the far side of the ridge, we could see a massive chocolate rack sticking up out of the leaves with our flash lights. 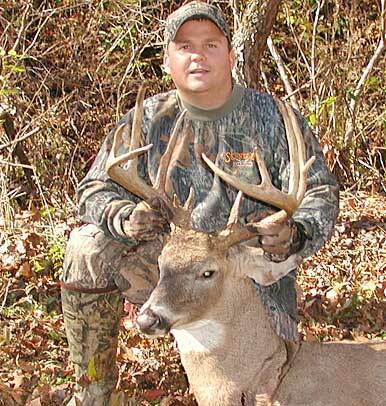 A huge 250 lb., twelve-point mature buck laid before our eyes. It was the biggest buck I had ever harvested with any weapon and I was very happy to share the moment with my father, a seasoned and dedicated bow hunter, and a good friend!